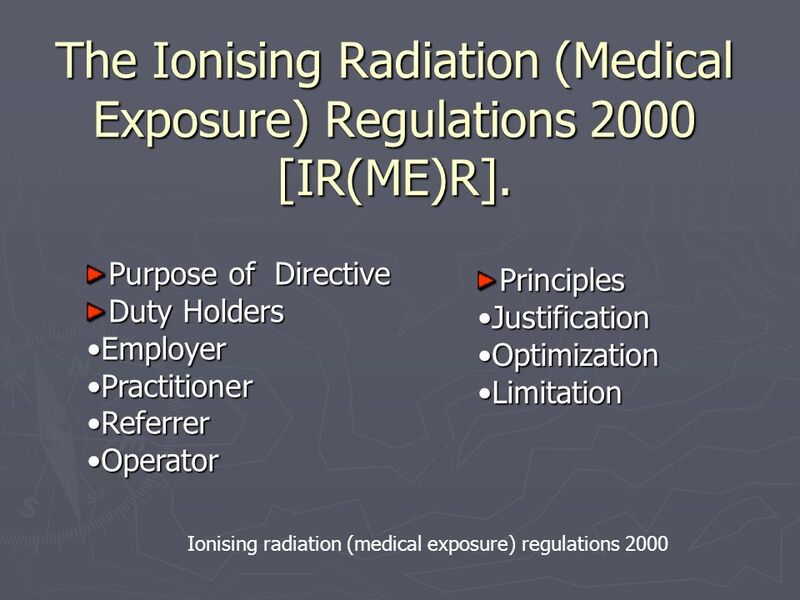 5 The Ionising Radiation (Medical Exposure) Regulations 2000 [IR(ME)R]. 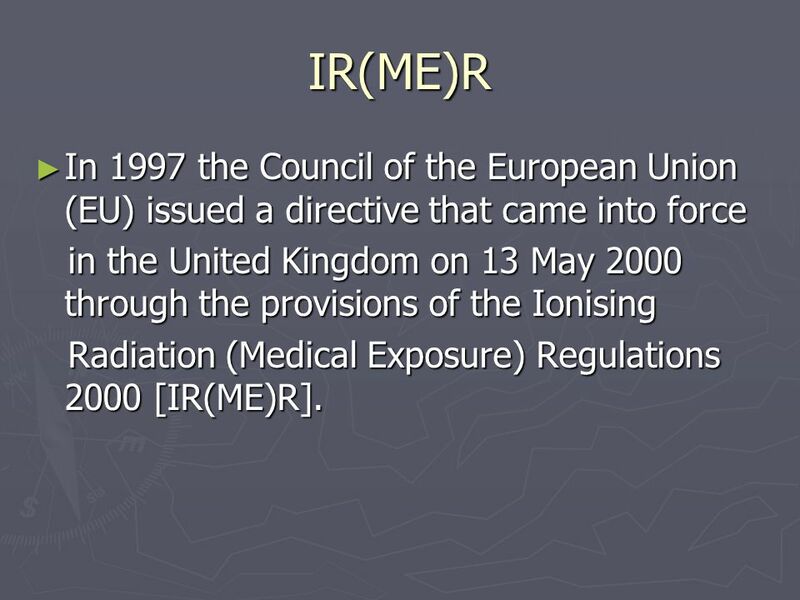 6 IR(ME)R In 1997 the Council of the European Union (EU) issued a directive that came into force in the United Kingdom on 13 May 2000 through the provisions of the Ionising Radiation (Medical Exposure) Regulations 2000 [IR(ME)R]. requested examination/s. 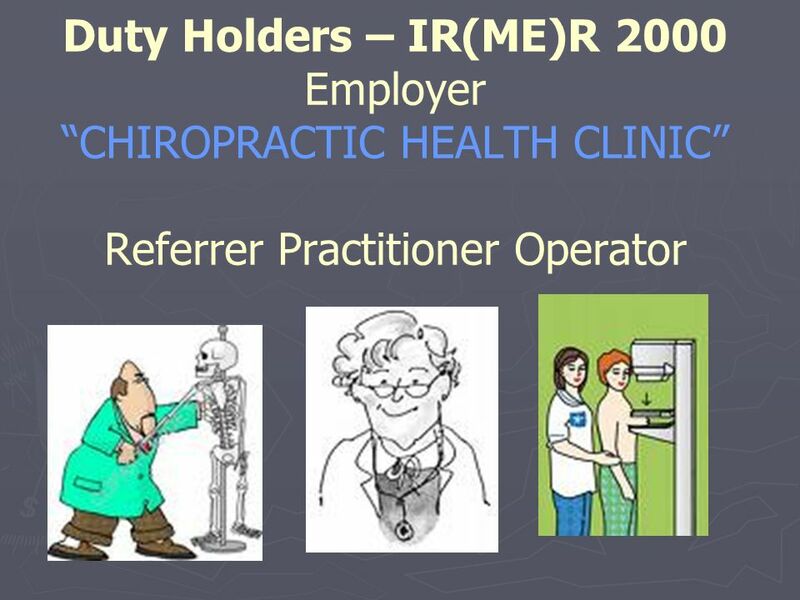 Decisions on who is entitled to act as a referrer should be taken at local level by agreement between the employer and the healthcare professionals involved in medical exposures. 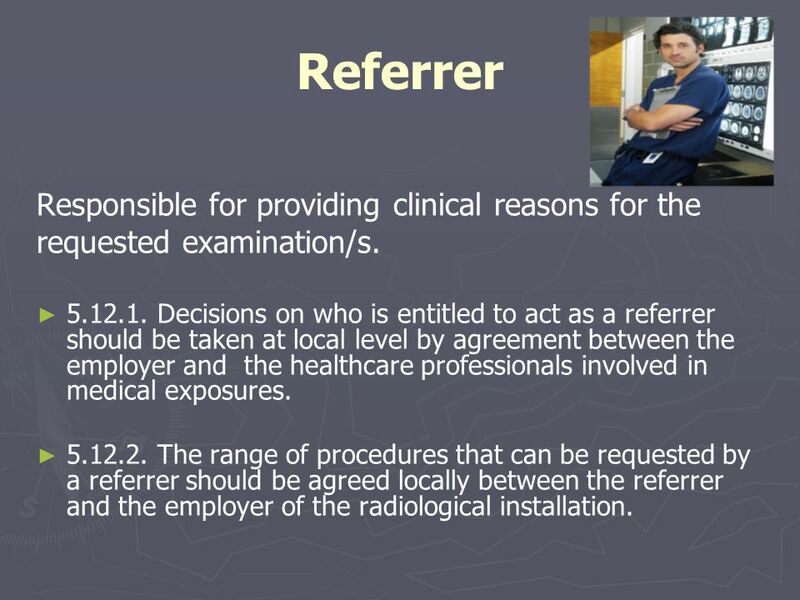 The range of procedures that can be requested by a referrer should be agreed locally between the referrer and the employer of the radiological installation. 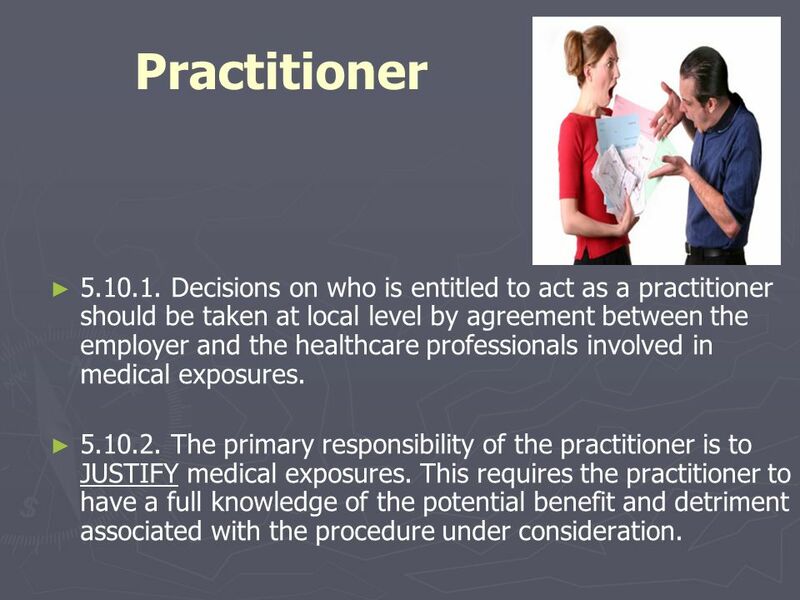 12 Practitioner Decisions on who is entitled to act as a practitioner should be taken at local level by agreement between the employer and the healthcare professionals involved in medical exposures. 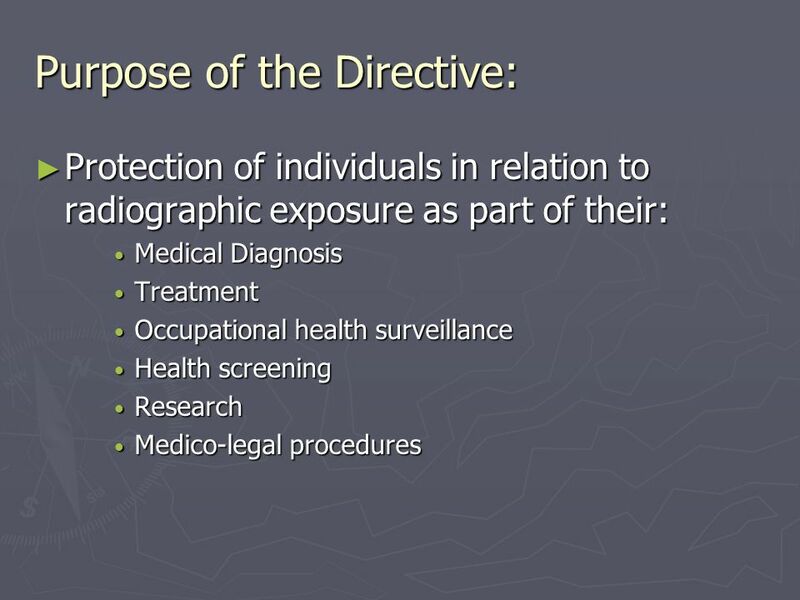 The primary responsibility of the practitioner is to JUSTIFY medical exposures. 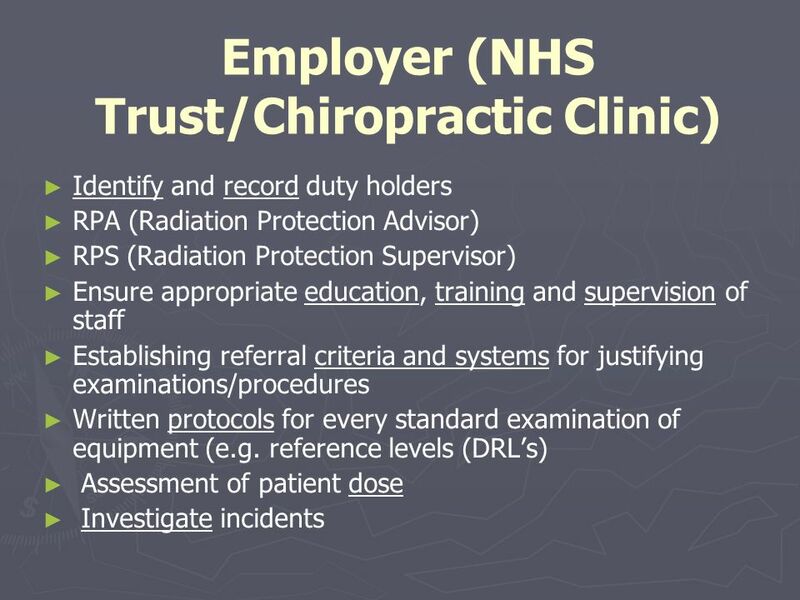 This requires the practitioner to have a full knowledge of the potential benefit and detriment associated with the procedure under consideration. 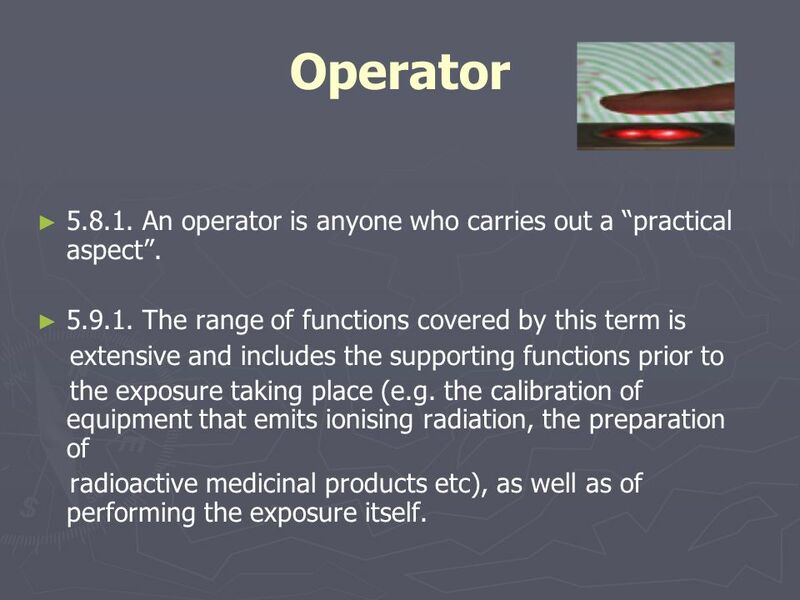 13 Operator An operator is anyone who carries out a “practical aspect”. The range of functions covered by this term is extensive and includes the supporting functions prior to the exposure taking place (e.g. 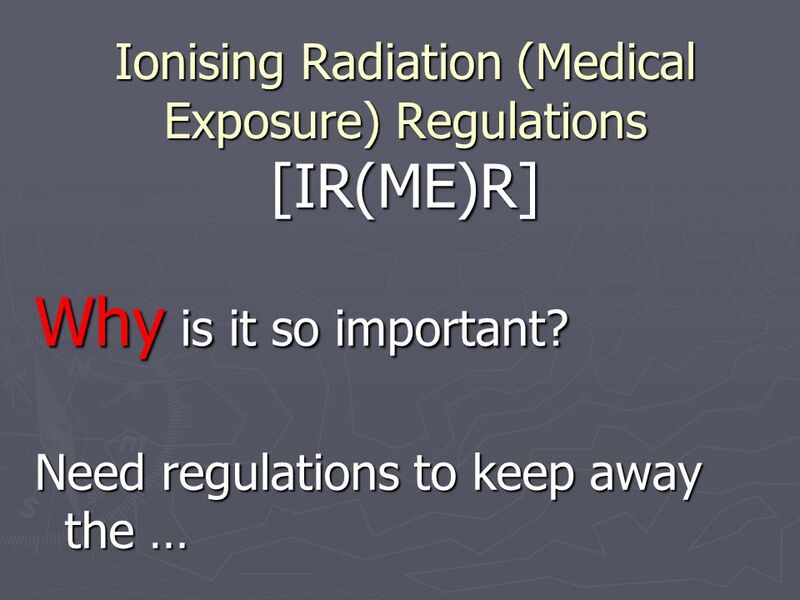 the calibration of equipment that emits ionising radiation, the preparation of radioactive medicinal products etc), as well as of performing the exposure itself. 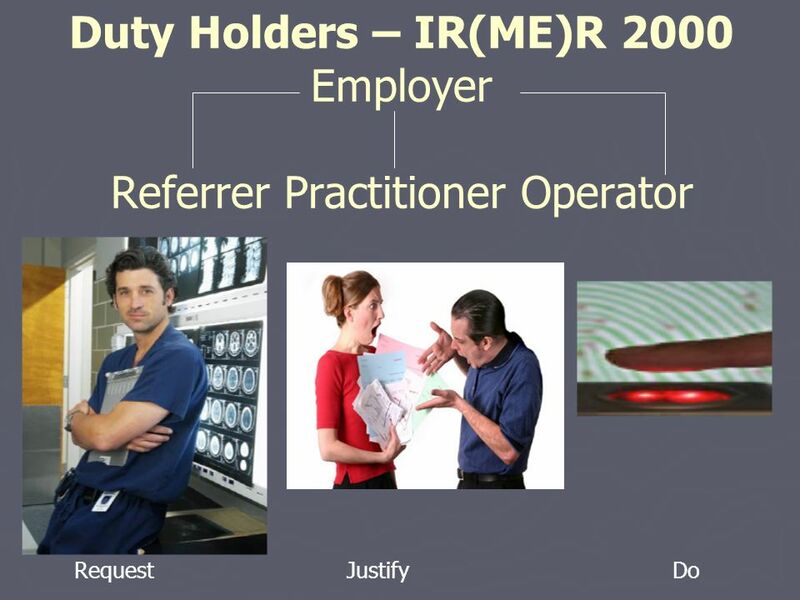 14 Duty Holders Is there always a referrer? 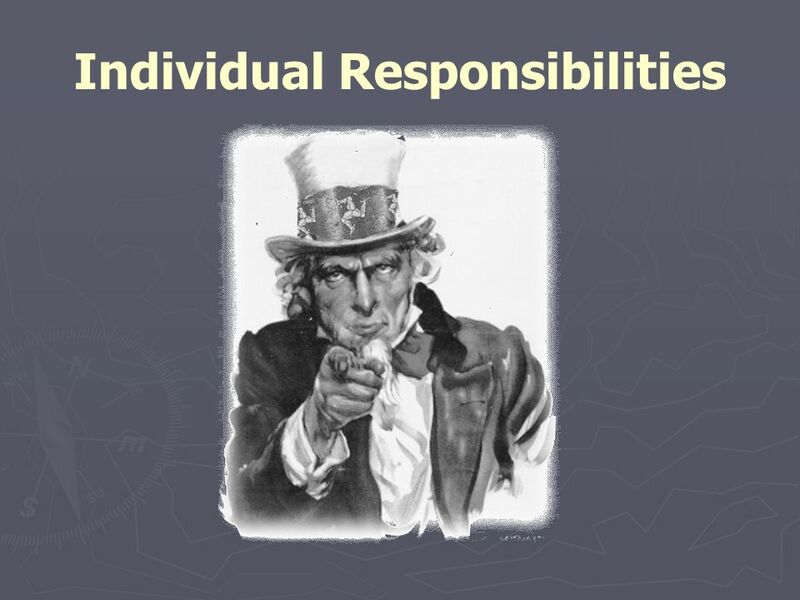 Can individuals fulfill more than one role? 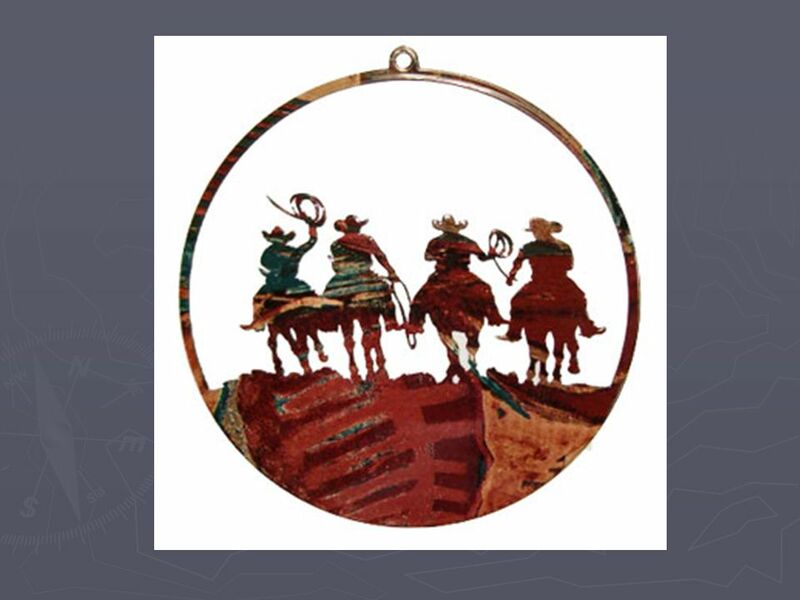 19 28 Day Rule: Menstrual cycle varies, generally 28 days. 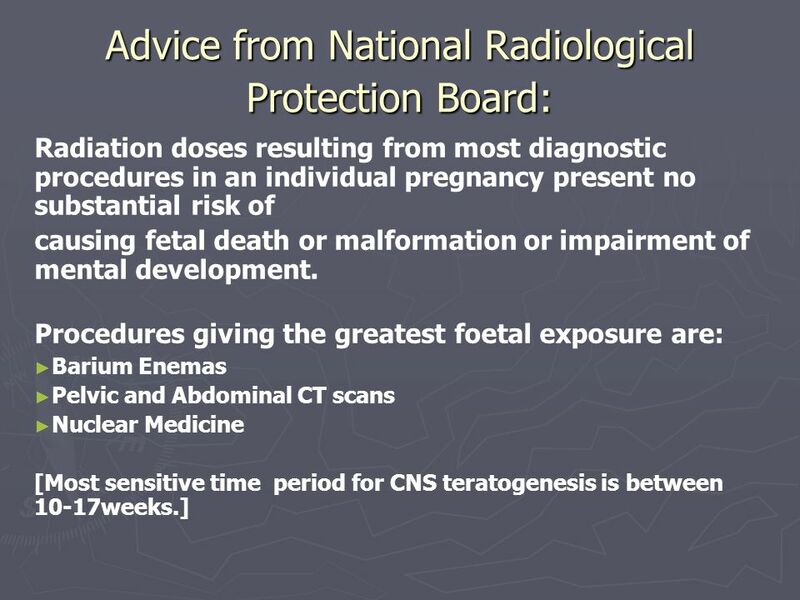 If patient is to be exposed to ionising radiation for diagnostic purposes and the patient is of child-bearing age, postpone exposure for 28 days from first day of menstrual cycle to next to rule out pregnancy. 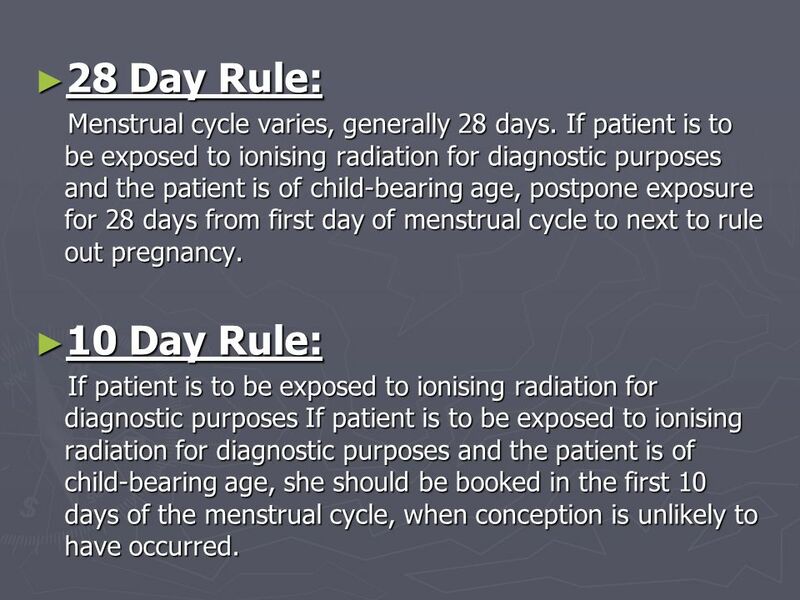 10 Day Rule: If patient is to be exposed to ionising radiation for diagnostic purposes If patient is to be exposed to ionising radiation for diagnostic purposes and the patient is of child-bearing age, she should be booked in the first 10 days of the menstrual cycle, when conception is unlikely to have occurred. 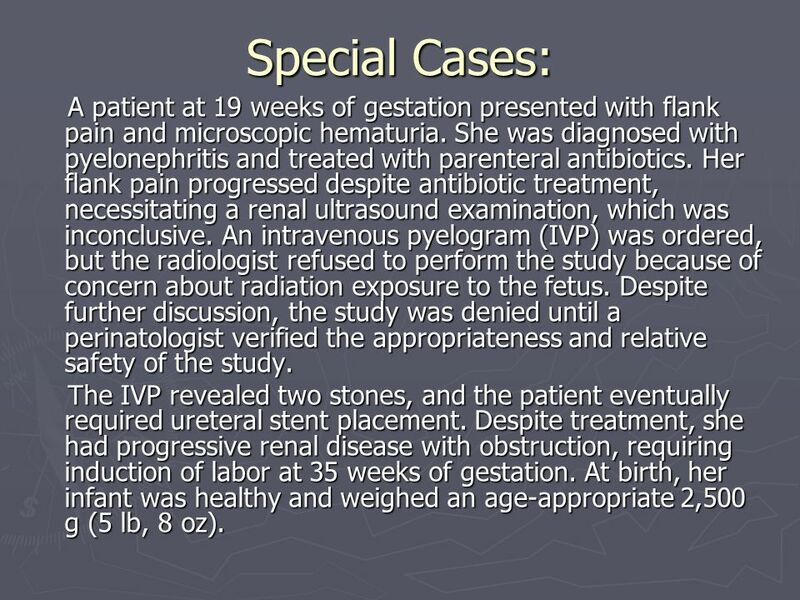 21 Special Cases: A patient at 19 weeks of gestation presented with flank pain and microscopic hematuria. She was diagnosed with pyelonephritis and treated with parenteral antibiotics. 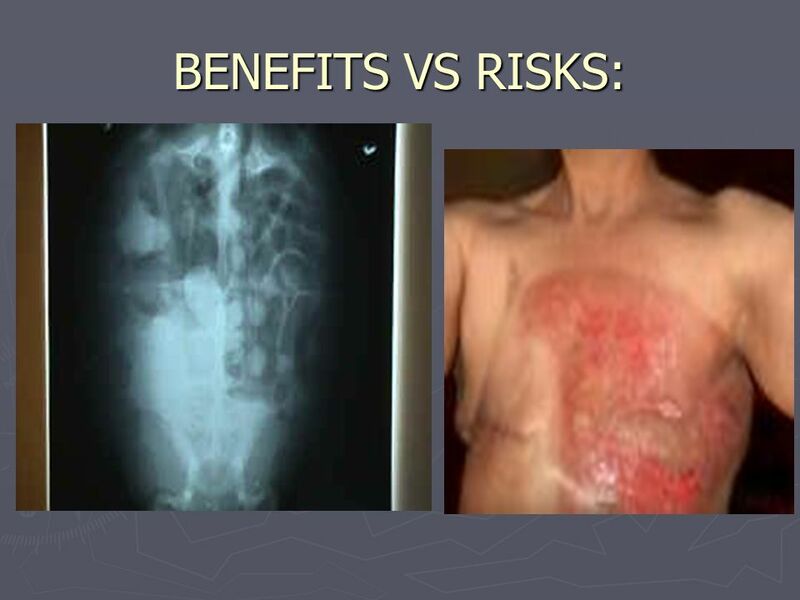 Her flank pain progressed despite antibiotic treatment, necessitating a renal ultrasound examination, which was inconclusive. 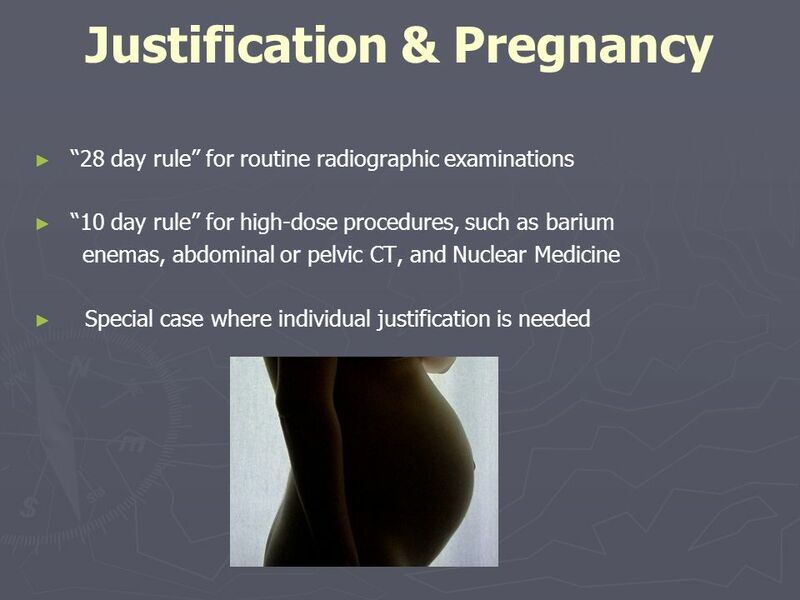 An intravenous pyelogram (IVP) was ordered, but the radiologist refused to perform the study because of concern about radiation exposure to the fetus. Despite further discussion, the study was denied until a perinatologist verified the appropriateness and relative safety of the study. The IVP revealed two stones, and the patient eventually required ureteral stent placement. Despite treatment, she had progressive renal disease with obstruction, requiring induction of labor at 35 weeks of gestation. At birth, her infant was healthy and weighed an age-appropriate 2,500 g (5 lb, 8 oz). 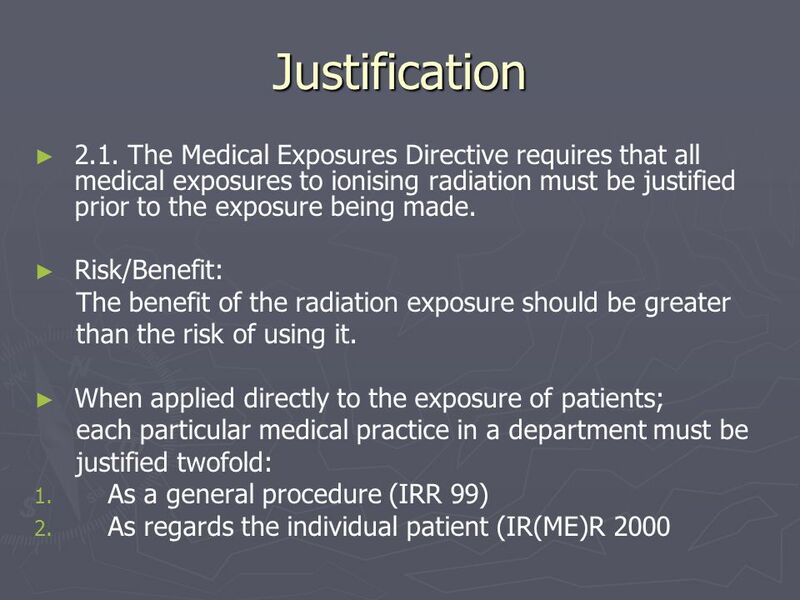 22 Justification When might an individual exposure be unjustified? 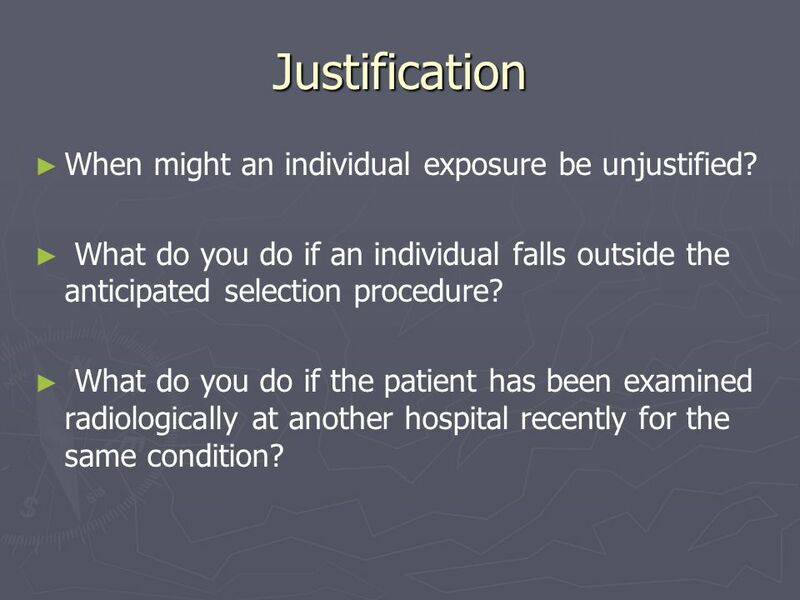 What do you do if an individual falls outside the anticipated selection procedure? 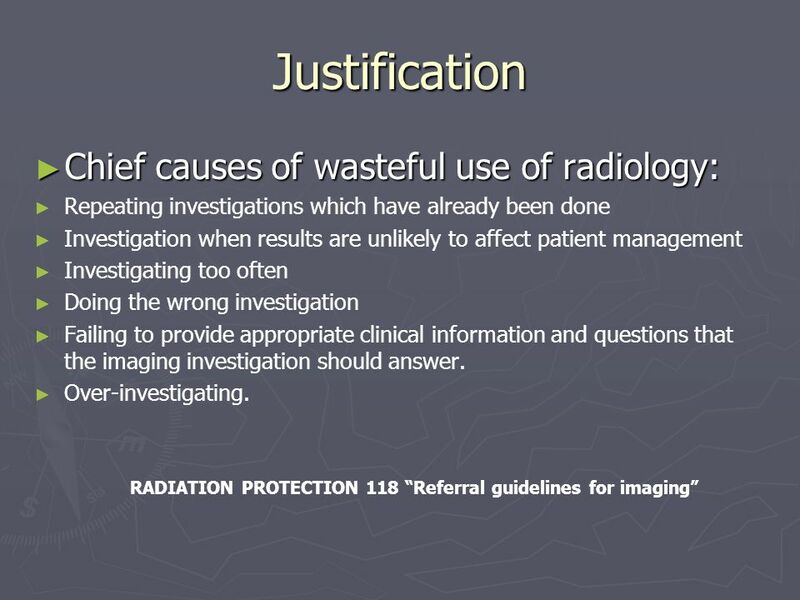 What do you do if the patient has been examined radiologically at another hospital recently for the same condition? 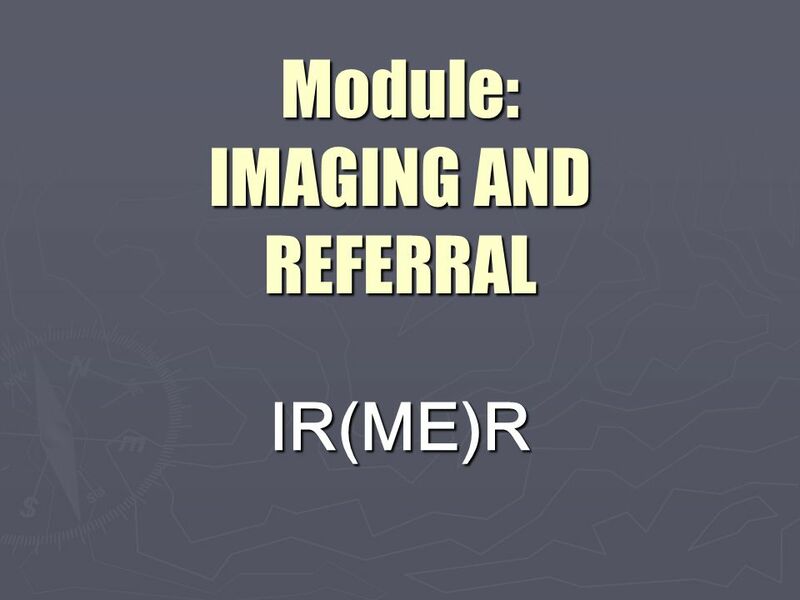 Download ppt "Module: IMAGING AND REFERRAL"
Data Protection: Health. Data Protection & Health Data Data on physical or mental health or condition or sexual life are ‘sensitive personal data’ with. This couldn’t happen in the UK. 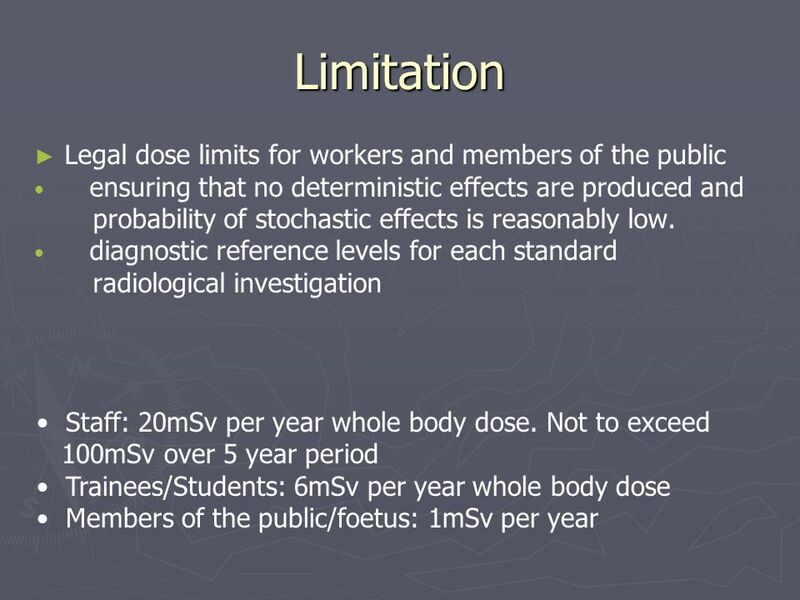 INTERNATIONAL COMMISSION ON RADIOLOGICAL PROTECTION —————————————————————————————————————— Pregnancy and Medical Radiation. 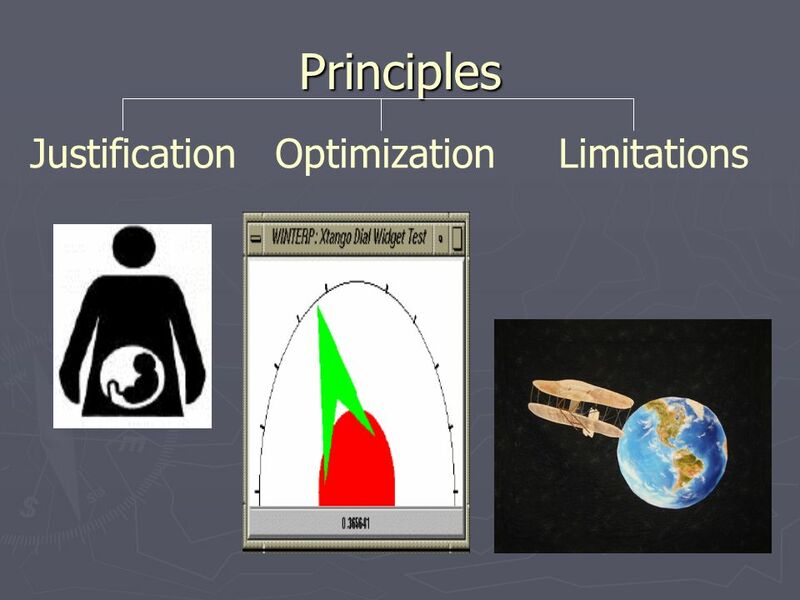 FPS HEALTH, FOOD CHAIN SAFETY AND ENVIRONMENTFPS PUBLIC HEALTH, FOOD CHAIN SAFETY AND ENVIRONMENT Medical Imaging Federal initiative Dr Aldo Perissino. 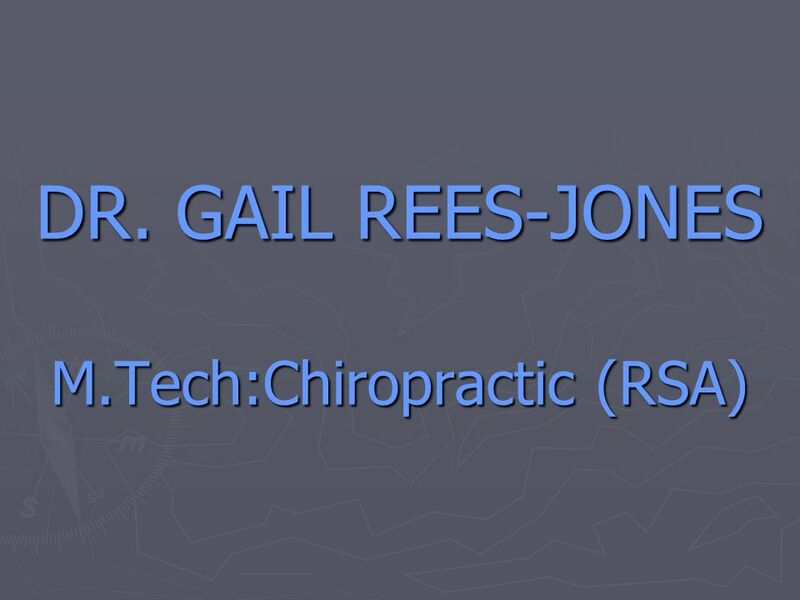 VICTORIAN INSTITUTE OF FORENSIC MEDICINE Sexual Assault in the Consultation Room Dr Angela Williams Clinical Forensic Medicine. Supporting and Protecting Adults From Harm Community Planning Board 10 th November 2011 Wendy Hinnie. 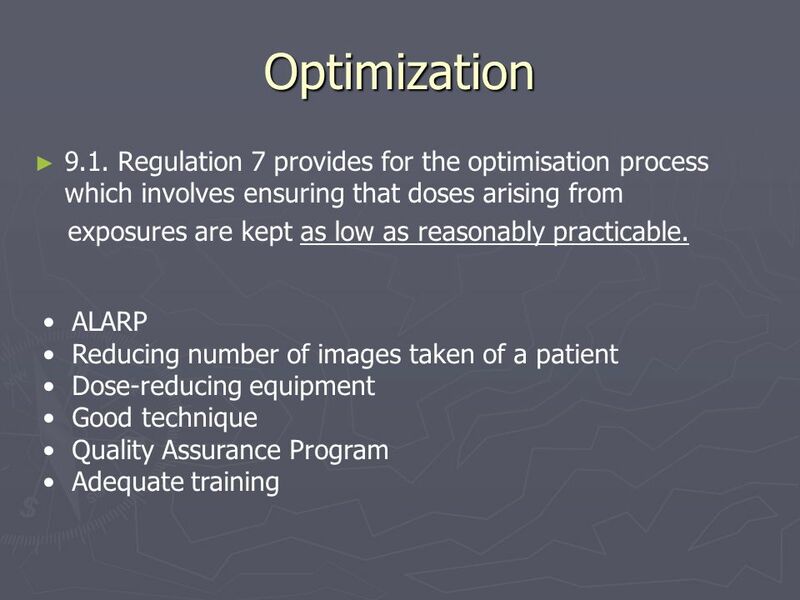 Research Protocol ACRIN 6678 Learning About PET/CT Scans: Can PET/CT scans provide helpful information for the treatment of non-small cell lung cancer? Consent for Research Study A study for patients newly diagnosed with advanced glioblastoma (brain cancer): Learning whether a PET scan with F-fluoromisonidazole. New Employee Orientation (Insert name) County Health Department. Prelim 11/14/11. 2 nd Semester, 3 rd Year Level  The Early 1900’s, With The Work Of An Industrial Engineer Named Frederick Winslow Taylor.  “Father.